Besides drumming for Iron Maiden, Nicko McBrain has two other passions: golfing and his restaurant, Rock and Roll Ribs. There are some Rockstars who share those same passions, most notable among them, Alice Cooper. Alice Cooper was a member of the Hollywood Vampires in the very early seventies; along with Jim Morrison, John Lennon, Jimi Hendrix and Keith Moon. Keith Moon died in 1978n in what was called the “Death Flat” in London, because it was the very same place where Mama Cass Elliot from the Mamas and the Papas had died. The Mamas and the Papas are the original writers of a song called “Dancing in the Street”, which caused a huge stir in the Van Halen camp when Dave Lee Roth wanted to record it for the Diver Down album. Diver Down had a lot of covers and among them a killer version (and video) of “Pretty Woman” originally recorded by Roy Orbinson. Roy Orbinson was also a member of the Travelling Wilburys with George Harrison, Jeff Lynne, Tom Petty and Bob Dylan. Bob Dylan’s tour of 1965 had backing musicians from a band called The Hawks. After the tour, those same musicians formed a new group called The Band. The Band’s last performance was immortalized in the Martin Scorcese’s film The Last Waltz. The Last Waltz features a lot of special guests like Neil Young, Muddy Waters, Van Morrison, Dr. John and Eric Clapton. When Eric Clapton was already famous due to his stint with The Yardbirds, his popularity skyrocketed when he recorded what became known as the Beano album with John Mayall’s Bluesbreakers. John Mayall’s Bluebreakers was also breeding ground for guitar players like Fleetwood Mac’s Peter Green and Free’s Paul Kossof. Paul Kossof is said to be the subject of the song “Wishing Well”, which the lyrics talk about a guy that is always unhappy and bordering on suicide. “Wishing Well” was also recorded by Southern Rock giants Blackfoot on their debut album, Strikes. Many people don’t know, but for a short period of time, Blackfoot had on its ranks Ken Hensley, keyboardist and organist from Uriah Heep. Uriah Heep bassist in 75-76 was John Wetton who found fame and fortune years later in Asia. However, before Heep he was a member of Family, with Roger Chapman. Roger Chapman after Family had a band called Chapman Whitney Streewalkers. Do you know who their drummer was? 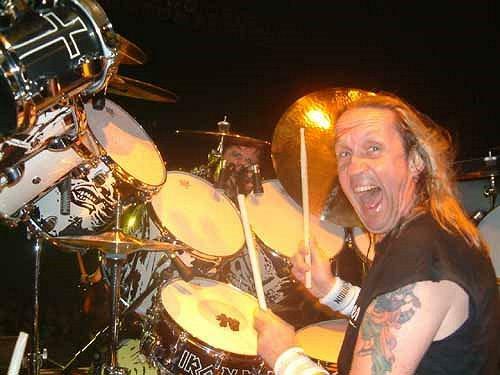 Current Iron Maiden skin hitter Nicko McBrain.